More than 3.000 people attended TT TOKE STARS, the festival Timor Telecom organized together with the Ministry of Tourism and Diocese Dili, Sunday, June 14. The capital’s Convention Centre was full to watch the cultural show TT offered with the presence of the main Timorese bands as well as some of the country’s greatest musical promises. Besides being able to purchase other Timor Telecom’s products, the audience received a TT bandana and a Dellos drink, one of the partners Timor Telecom chose for the event: the others were the Casa Vida project, Sapo.tl and Colgate, who distributed hygiene kits. 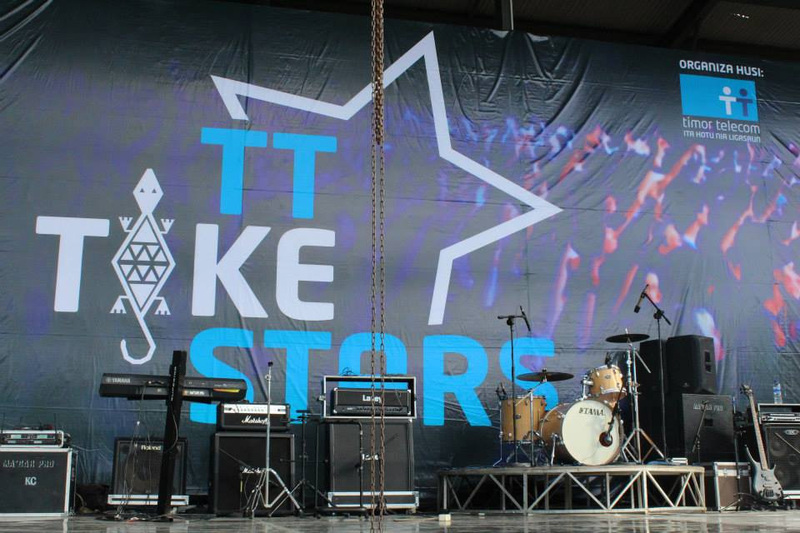 To understand the scale of the event, TT TOKE STARS had more than 100 artists performing at the DCC and more than 200 people in the organization, starting with Macar’s staff, responsible for the sound system and lighting on stage, and No Limit’s, which held extreme sport activities that many people practiced for the first time. The show began with a performance of Zumba Dili, which saw the participation of dozens of people, something also seen when MAC-Capoeira took the stage. Musical diversification was another aim reached: João Rocha and Gilda Rocha brought a hint of Portuguese to the festival. The same happened in the performances of Magzad and Dejukddil Putri Band, the Timorese girls’ band that gave a special color to TT Toke Stars. Two of Timor-Leste’s musical promises, Ventura and Frengky had the support of Kraken, and later, when it was already night, Klamar and Galaxy arose in DCC with the fervent support of the many fans that the two bands of Los Palos have. The concert ended with a great performance of 5 do Oriente, who came down from the stage and, together with some elements of other bands, embraced the public in a final dance to the sound of “Hadomi Timor”, the perfect end to this great TT event. 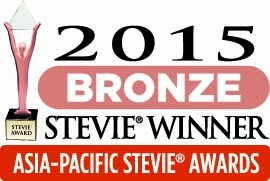 Timor Telecom was named a winner of a Bronze Stevie Award in the New Products & Services: Consumer Products & Services category in the second annual Asia-Pacific Stevie Awards today. TT was awarded Bronze in that category due to its “Wikipedia Zero” project. In September 2014, Timor Telecom announced a partnership with the organization that runs Wikipedia and, since then, offers unlimited and free access to that website, an initiative that benefits all Timorese, specially students, who can, therefore, broaden their knowledge. This is the second time TT is distinguished with this international award. In 2014, the operator was awarded Another Bronze Stevie Award, in the “Customer Service Leader of The Year” category, that’s to the restructuring of its Call Center. That same restructuring gave TT a Silver Stevie Award in the International Business Awards. The Asia-Pacific Stevie Awards are the only business awards program to recognize achievement in the workplace in all 22 nations of the Asia-Pacific region. The Stevie Awards are widely considered to be the world's premier business awards, conferring recognition for achievement in programs such as The International Business Awards for more than a decade. Nicknamed the Stevies for the Greek word for “crowned,” the awards will be presented to winners at a gala banquet at the InterContinental Hotel in Shanghai, China on 5 June. “After the awards received in 2014, this is one more proof that Timor Telecom’s market leadership does not happen by chance. We are shoulder to shoulder with the best in Asia, and even the World, and this Wikipedia Zero award has a double satisfaction, because it happens thanks to a project with a great social meaning. A project that allows the Timorese people to have access to a world of knowledge, free of charge, something that only TT could offer, because it recognizes the importance of developing the Timorese society”, Timor Telecom’s CEO, Manuel Joaquim Capitão Amaro said. Gold, Silver and Bronze Stevie Award winners were selected by more than 50 executives around the world who participated in first-round judging in March and April. A second international panel of judges will choose Grand Stevie winners from among the Gold winners in May. The Grand Stevie winners will be announced at the 5 June banquet in Shanghai. On the 24th of October, Health Alliance International and Catalpa International signed an agreement with Timor Telecom in support of the Liga Inan program. Liga Inan nu’udar programa Saúde/Health ne’ebé uza teknolojia móvel hodi liga inan isin-rua sira ba entidade sira ne’ebé halo servisu saúde iha Timor-Leste, ho forma ne’ebé aumenta probabilidade isin-rua no bebé moris ho saudável. Liga Inan, a Health program is using mobile phones to connect expectant mothers with health care providers in Timor-Leste to improve the likelihood of a healthy pregnancy and birth. Liga Inan, generously supported by the American people through USAID, was officially launched in March 2013 by Health Alliance International (HAI) and Catalpa International in partnership with the Ministry of Health in Manufahi District. The mobile service was designed and developed by Catalpa International, a software development and services firm which provides innovative, simple and effective solutions in a development context. The Liga Inan service sends maternal health-related text messages twice weekly to pregnant women enrolled in the program. Liga Inan also facilitates contact between pregnant or postpartum women and their midwives, including regular phone contact around the time of delivery. In June 2014, the Australian Government awarded funding to HAI to expand Liga Inan into two additional districts, Liquica and Aileu. To date, over 2,310 women have been enrolled in the program as of October 24 2014. 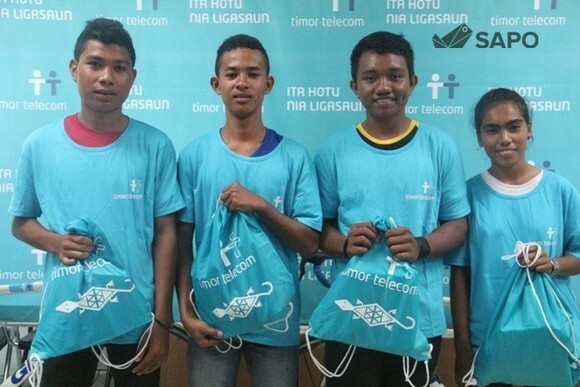 Now, Timor Telecom comes on board to support the Liga Inan program. The Liga Inan mHealth program is the first of its kind in Timor-Leste and ultimately aims to improve birth outcomes. Early results from Manufahi District, where the project has been running the longest, are promising with increases in women coming in for maternal care services. More information about Liga Inan can be found at the project website at www.ligainan.org. When Timor Telecom, the largest telecommunications operator in Timor-Leste with a 12 year history operating in the country, heard about the Liga Inan program they contacted HAI and Catalpa to see how they could get involved in support of the project. Timor Telecom is excited to offer their sponsorship to support Liga Inan to improve the health and well-being of Timorese mothers and babies. “We are very excited to be enrolled in a project of this importance and dimension. Timor Telecom has supported social responsibility projects ever since it began in Timor and has always had a strong commitment to the welfare of Timorese society. The Liga Inan project embodies Timor Telecom's main guidelines towards sustainable development.” –Joaquim Manuel Capitão Amaro, CEO Timor Telecom. The corporate sponsorship from Timor Telecom will support the cost of thousands of text messages sent to pregnant women about how to have a healthier pregnancy. This important partnership between HAI, Catalpa and Timor Telecom, the Ministry of Health and with generous support from the Australian Government to expand the program will result in Liga Inan being offered to many more Timorese families. 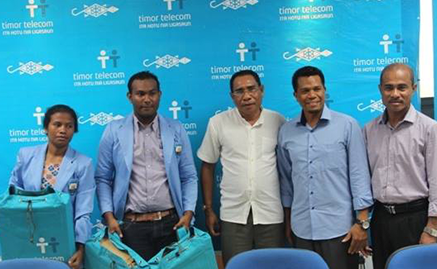 Timor Telecom (TT) renewed the contract with the Timor Leste Cycling Federation (FCTL) on Tuesday, March 11, 2015, and presented the TT Elite Athletes teamto strengthen its strategic association with Timorese sports, and cycling in particular. As the Official Sponsor of FCTL, TT thus increases its investment in the future of Timorese cycling, by continuing to support the TT Elite Athletes project, which this year has four cyclists: two in BMX and two in MTB. Zefemia Santos Soares Babo (BMX athlete). Born on 8 May 1996. David Espírito Santo Morais (BMX athlete). Nascido a 18 de julho de 1997. Sebastiao Domingos Ximenes Belo (MTB athlete). Born on 18 July 1997. Henrique Horta (MTB athlete). Born on 20 July 1998. TT has decided to start this strategic sponsorship to athletes in 2013 aiming to consolidate its presence in sports, other than football. Relevant positions in the international UCI ranking in Mountain Bike. The TT Elite Athletes 2015 will be supported by last year’s team, consisting of athletes and their coaches and mechanics, to support the current young athletes. The TT Elite Athletes is a solid team of young Timorese athletes with strong potential, known in the international arena, supported by TT as part of its strategy to help those who have talent, perseverance, creativity, effectiveness, value, and competitiveness. With this strategy, TT aims to encourage sports at national level, also helping to disclose the best to the world, creating a network of TT “ambassadors” who represent the colors of Timor-Leste abroad. Timor Telecom (TT) is awarding today the 3 winning teams from the “Wikipedia Challenge”, which run from 22 September to 5 November 2014. The prizes include tablets, laptops and mini-laptops being offered to the Universities for their support and encouragement of this competition. TT has recently celebrated a partnership with Wikipedia and has consequently launched “Wikipedia Challenge”, a competition which encouraged university students to write an article in Tetun. Timor Telecom has released three themes: José Ramos-Horta, XananaGusmão andNicolau dos Reis Lobato. The articles from the three best teams will then be published in Wikipedia, thus becoming the ambassadors for the Wikipedia in Tetun language. This competition was established for the Universities with which TT has celebrated protocols, namely: Universidade da Paz, UNTL – UniversidadeNacional de Timor Lorosae, Institute of Business (Pantai and Kelapa), DIT – Díli Institute of Technology, UNITAL – Universidade Oriental, UNDIL – Universidade de Díli and Instituto Superior Cristal. With the “Wikipedia Challenge”, Wikipedia and Timor Telecom intend to promote writing and the publishing of articles written in Tetun, aiming at the development of the Tetun language. Wikipedia is the biggest encyclopaedia online, visited by around 500 million people monthly, according to data from ComScore Media Metrix. With more than 29 million articles, Wikipedia results from the contribution of a global community comprising around 80 thousand volunteers. Being the largest telecommunication operator in Timor-Leste, Timor Telecom (TT) has been operating for almost 12 years, serving more than 600 thousand clients. TT has conquered this position as a solid and dynamic corporation, having gone through several challenges and supporting Timorese people since the restoration of independence. Nowadays TT is, undoubtedly, the market leader within its activity sector, being a strong and a trustworthy company, offering a mature network and high quality services, covering all districts of the country and 94% of Timor-Leste population.